The title is appropriate since I’m back at painting daily after a long absence of about three weeks. I’m happy to report that all went well with my surgery and I’m thrilled to have new processors on both ears. They’re working very well, but lots of work on my part is ahead to get my brain recognizing words and sounds from my left ear as well as my right ear which was implanted originally in 2000. With a CI it’s more your brain than anything that does the work since the ear is bypssed altogether. I chose this image and started the drawing before I left for Chicago weeks ago. It’s been sitting unfinished on my drafting table all this time waiting my return both physically and mentally. This is a scene from our village of Alcocer during harvest time. Corn is a staple of Mexico, not only for grinding corn into meal for tortillas but also for the fodder that the stalks provide for feed for the animals during the long dry season when food in the pastures is scarce. 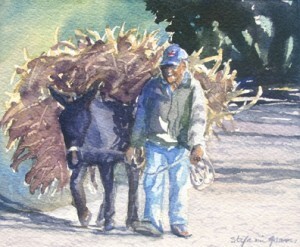 The local farmers, like this elderly gentleman, take their donkeys to the corn fields and load them to overflowing with harvested stalks to be stored in their paddock. I admire both of their patience as seen in their unhurried gate and body language. More images from Mexico, this time a familiar scene in the Fall going to Alcocer where our house is in Mexico. The 2.5 mile road starts at the bypass around San Miguel at the southeast corner of the city and gradually ascends to the village, curving through fields of grass and corn. It’s a typical cobblestone affair that you learn to drive about 30 miles per hour lest you jar your fillings loose. Speed tends to even out the bumpiness.Â Around October the farmers, our neighbors, harvest the corn and then make piles of fodder from the cornstalks that will eventually become food for their livestock during the winter months. It’s not the cold and snow they put up this larder for, but rather the long dry season which is just beginning at that time and that will last until mid-June. I love these stacks dotting the Fall fields. Just like Monet’s haystacks they reflect the waning light as the sun recedes in the west, making a wonderful canvas of changing color. It’s an old fashioned scene that we don’t see in the states. 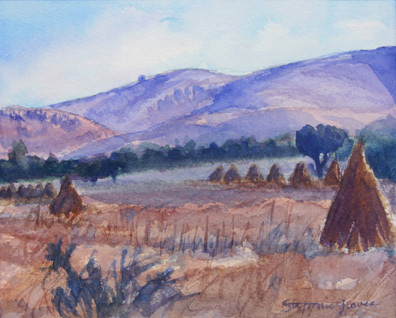 The cones of cornstalks are painstakingly gathered and shaped by hand, groups of people arriving in the fields early in the morning and working through the day each day until everything is gathered. Then in the days ahead the farmers will load their mules and wagons with enormous loads from the stacks to transport to their property in preparation for the coming months. It’s like stepping back in time to see the Fall harvest. Like yesterday, this is mostly a direct painting without a preliminary drawing. 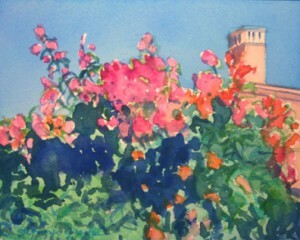 I did put in a few lines to designate the chimney as well as the general location of the flowers. But it was just that, a few lines, nothing to tell me where every petal or leaf was. I find that this approach works best for me when trying to do an array of flowers like this. You want the mind to fill in the blanks, giving the viewer just enough information to get the idea of the flowers you’re painting. Bougainvilleas grown in wild abandon in San Miguel and all of Mexico for as far as I can tell. They are in great profusion during the rainy season, and I find their brilliance almost unimaginable against the bright blue sky. It truly is azur, no other word for it, and certainly not the kind of blue I ever see in the north. The light that makes these colors possible is indescribable. I sometimes like to paint directly without preliminary drawing. It forces me to work more quickly without thinking so much and to be looser in my technique. I always have to kind of steel myself for possible failure, but I’ve done some of these before so I’ve gotten more used to flying without a net. With a packed schedule today I didn’t have a lot of time for fussing and so when I chose my photo I decided I just needed to do it, be damned. The result is today’s painting and a fair effort, if I do say so myself. The guy with the bass would have been nicer a bit to the right so that everything was in the picture, but that’s what happens when you go at it as I did today. You commit with the brush and deal with whatever comes. That meant that my bass player lost a bit of his instrument. The figures in the back are believable though I’m still working to improve that kind of figured work. Background people are really hard to do convincingly and at the same time look fluid and natural. Still workin’ on it. 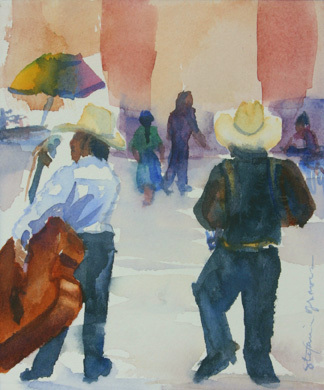 The two guys in the foreground are street musicians in a little town not far from San Miguel. The one on the right has an accordian, though you really can’t see much of it. 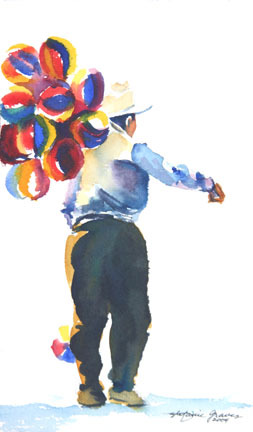 People freely play on the street for a little money, ride buses with their guitars to serenade the passengers, and then there’s the ever present mariachis. You come to expect a little background music with your day in Mexico. This week life has gotten in the way of my daily painting schedule, mostly having to do with art. Over the past ten days I’ve been heavily into re-painting a painting I created this Spring. I’d entered it into a show, actually two shows, without realizing they ran simulainteously. Must have been distracted. Of course it was accepted into both shows, so to make good I agreed to re-paint it for the second show, which they were happy to have me do. I finished it yesterday and shipped it out along with another painting for the show that had been accepted. Today, Dave was off and wanted to go to the DuQuoin State Fair in southern Illinois. State fairs are a tradition in my family, having gone to the Indana State Fair every year of my childhood. We’d spend the day looking at all the farm animals, checking out the manufacturer’s building, and eating lots of food on a stick. It was much the same year after year, but it was something we looked forward to. Now Garrison Keillor has written an article about state fairs in the latest edition of National Geographic, and I find that my home state State Fair is one of a dying breed, most of them except for the few that have found a way of holding on to their success have gone by the wayside. So we went to DuQuoin and checked out the choices of food on a stick (we selected corndogs for tradition — you can’t beat that) and a lemon shakeup to wash it down. Then we took in the trotters and donated money to the Illinois Gaming Board. We looked at a whole lot of milk cows and saw a competition for the adult division of Western Saddle Riding. I petted a few horses and lamented still this late in life never having owned one. In any event, we tottled on home at about 3:30pm having decided we’d had enough fair experience for one day. No ferris wheel rides to jangle my fear of heights, no salt water taffy to rid us of fillings and create the need for more. And I brought home a prized souvenir of a large handful of sheep’s wool gifted to me by the sheep farmer who kindly answered my questions. Now I’ll have to find how to card it and spin it. 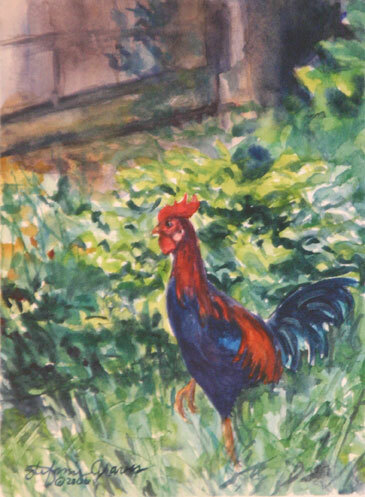 Today’s painting is from several years ago painted from a rooster in Bali. He was just one of many I saw during that trip and became enchanted by. Appropriate for today’s activities, though there were no roosters. Imagine that. A state fair with no poultry barn. How strange. All the signs are here that summer is drawing to a close. The grass still grows but it’s darker. Our sycamore’s leaves are beginning to look brown around the edges, and there are no more fledglings, only gold finches feeding at the dried sunflower seeds in our flower gardens. Monarch butterflies are more frequent, my theory being that they’re heading south to Mexico. But perhaps the biggest sign is that our tomato plants are giving what is surely their final production of fruit. We’re bringing in armfuls daily, so many we can’t keep up. The plants themselves are looking old and beginning to dry out. The basil in front of them is sending out flowers and getting thin. September has turned and so we face the end of summer. 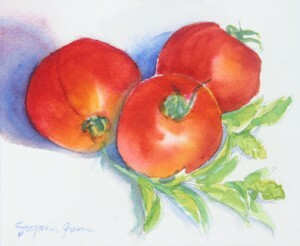 My quick painting today is a glimpse of our garden’s bounty which we’ve enjoyed so much this year. I felt it needed a fitting tribute in honor of what it’s given and so I picked a new tomato to go along with two we’d brought in this weekend, and paired them with a couple pinches of basil. They marry so well in cooking and I think they go as well visually. Just one of the memorable tastes of summer, tomato and basil.